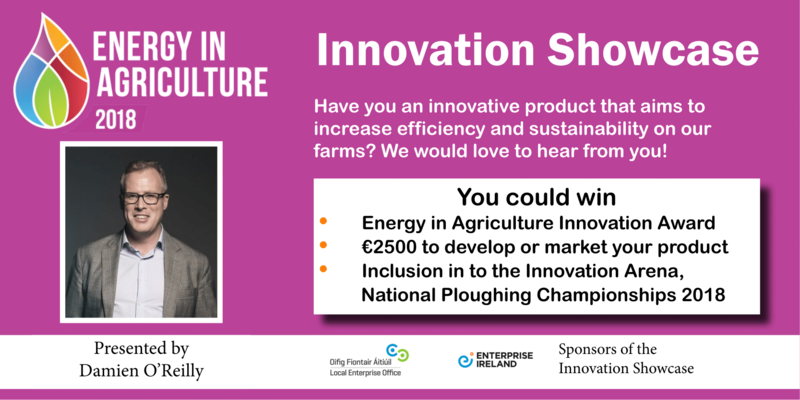 Energy in Agriculture has recently launched a call for entries for the Innovation Showcase which will be held in the main EXPO arena on the afternoon of 21st August 2018. This is an exciting new element to the already very popular line up for this key agricultural event. The Innovation Showcase will be facilitated by Damien O’Reilly from RTE’s CountryWide who is looking forward to seeing some new products/services & technologies that will contribute to increased efficiencies and sustainability on Irish farms. For the successful applicants, the Innovation Showcase presents a unique opportunity to profile new products to a receptive market with the added potential of good media coverage on the day surrounding this new initiative. On hearing about this new element to the Energy in Agriculture event, Enterprise Ireland and the Local Enterprise Office were keen to get involved and row in behind the event with their support. “The Local Enterprise Office (LEO) in the South East Region in conjunction with Enterprise Ireland, Teagasc, Department of Agriculture, the Institutes of Technology, the Irish Farmers Journal and industry held a very successful AgTech Symposium in 2017. The symposium aimed to identify and develop the opportunities and strengths of the agricultural technology sector in the region and to create a vision for AgTech that will incorporate both innovation and sustainability. The event explored ways to progress and adopt new and emerging technologies and solutions to increase productivity, profitability and promote new market diversification. The sponsors of the 2 categories of prizes are looking forward to attending the event and meeting the innovators in this sector. “The LEO has a suite of supports for new product and new business development which they are anxious to discuss with new and existing business promoters at this event” added Miss Guinan. An overall ‘Energy in Agriculture Innovation Award’ for the best innovation that improves efficiencies on Irish farms or contributes to the de-carbonisation of agriculture. An Enterprise Ireland sponsored award for ‘Best Indigenous Innovation’ where the winner will be offered automatic inclusion and exhibition at the Innovation Arena, National Ploughing Championships 2018 plus mentoring support in advance of the event. Anyone interested in applying to showcase their innovative product at Energy in Agriculture 2018 should click here for full details and online application form.